Trailhead and parking area are at the end of Zealand Road in Bethlehem, NH (Zeacliff is in Lincoln). Zealand Road leaves Rt. 302 2.2 miles east of Rt. 3. Drive 3.5 miles to the end of the road and park in the large parking area on the left. The Zealand Trail begins at the end of the road. Mt. Bond is located at the heart of the Pemigewasset Wilderness. At the south end of the Twin Range, it is surrounded by valleys on three sides, with a ring of mountains across those valleys. This gives hikers on its summit a sense of isolation found nowhere else in the White Mountains. Many say it is their most spectacular place. Even the hike to Mt. Bond is breathtaking. A river, marshes, ponds, waterfalls, and an AMC hut are all found in the first three miles. After a moderate climb, you are rewarded with the vista from Zeacliff, a fine hike on its own. From there, a long, mostly easy ridge walk brings you across Zealand Mountain, a viewless 4000-footer. Views abound in the upper section of the hike. In the final two miles, you will enjoy the unmatched wilderness views from Mt. Guyot, West Bond, and finally Mt. Bond. From the parking area, walk past the sign for Zealand Falls Hut and begin your journey on the Zealand Trail, which begins on the grade of an old logging railroad. Soon, the trail leaves the grade and becomes rocky, traveling through a beautiful forest. Several small brooks are crossed on wide bridges. In 0.8 miles, after returning to the railroad grade, the trail meets the Zealand River. Walk out to it to see a pretty cascade. The trail continues upward toward Zealand Notch, barely climbing at all. Eventually, it crosses Zealand River on a bridge. Several unbridged brook crossings are made after this. At 1.7 miles from the parking area, the trail passes through a large marsh on a boardwalk (formerly known as the Z-bridge; recently reconstructed). From this boardwalk, there are good views over the marsh to Zeacliff. The trail runs flat for a while, then in another half mile, it passes a limited viewpoint of Mt. Tom over a grassy meadow surrounding the much smaller Zealand River. Stay straight where A-Z Trail goes to the left. The trail then crosses the marsh at the north end of Zealand Pond, then leads to a viewpoint over Zealand Pond. On the hillside above the still waters, you can see the cascades above Zealand Falls. At 2.5 miles from the the parking area, turn right onto Twinway. The trail leads through a small wet area, then passes a set of cascades on Whitewall Brook. Walk out onto an island in the middle of the brook for the best perspective. The trail now becomes rocky and begins to climb more steeply. At a sign on the left, a spur leads to Zealand Falls, an unusual and impressive waterfall, distinguished by its rectangular central chamber, which two cascades pour into from opposite sides. The trail climbs steeply to Zealand Falls Hut, reached at 0.2 miles from the Zealand Trail. Here, there is a limited view over the trees of Whitewall Mountain. Before continuing on the trail, follow a spur path to the left out to Whitewall Brook, where, alongside cascades, there is a view down to Zealand Pond. Beyond the hut, the trail follows the brook. Several herd paths lead out to more cascades and pools. Not too far from the hut, bear left where Lend-a-Hand Trail goes right. The trail then makes a somewhat difficult crossing of Whitewall Brook, followed by one more major brook crossing and several tiny stream crossings. Now, it climbs steadily and steeply through the forest for a mile. Near the end of its climb, the trail swings to the left, soon emerging on ledges. Wildflowers line the trail as it heads toward Zeacliff. Turn left at a view sign and follow the loop path out onto the magnificent Zeacliff outlook. 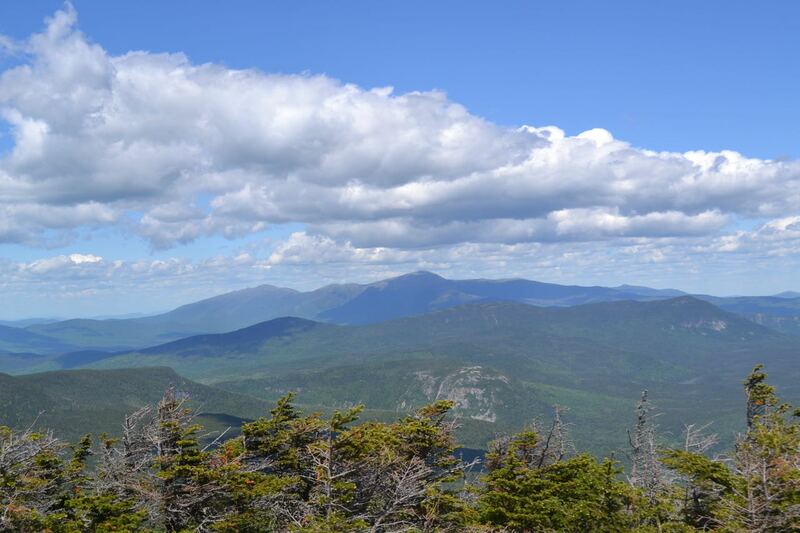 From the sunny ledges, you have a sweeping vista over the eastern Pemigewasset Wilderness. Directly below you is Zealand Notch and the talus on the side of Whitewall Mountain. Above is the Willey Range, with the Presidential Range behind. To the right of the Willey Range is the southern Montalban Ridge. Rising from the vast valley is low Shoal Pond Ridge, with Shoal Pond at its northeast end. Across the valley is the Nancy Range, separated from massive Mt. Carrigain by deep Carrigain Notch. To the far right is Mt. Hancock. By walking down to a lower ledge, you can glimpse Mt. Bond. From the ledges of Zeacliff, continue along the loop path, ending back at Twinway in the middle of an alpine bog. Turn left and follow the bog bridges through the wetland. Watch for wildflowers and bog plants. At the end of the bog, the trail returns to solid rock and continues at easy grades. There are limited views through the trees. In 0.1 miles, Zeacliff Trail enters from the left. The wilderness boundary is just down this trail, but since the Twinway (as part of the Appalachian Trail) forms the boundary, you will not enter the wilderness until near the end of the hike. The trail continues at mostly flat grades into the forest. In 0.4 miles, a spur on the left leads 0.1 miles to Zeacliff Pond. This side trip is not included in the mileage shown for this hike, as the spur involves a 100-foot descent, adding more elevation change to this already long and exhausting hike. If you do make the side trip, you will be rewarded with a view of cliffs on the ridge over the bog-like pond. The trail now makes a steep and winding 0.3 mile climb, involving rock scrambles and a wooden ladder. Along the way, you can glimpse Zeacliff Pond through the trees. At the top, there is a limited view of Mt. Hale from a knob unofficially named Zeacliff Pond Peak. After dropping off the summit of this knob, the trail treks 0.9 miles across pleasant Zealand Ridge at very easy grades. Footing can be wet, but there are many bog bridges. As the trail approaches Zealand Mountain, it steepens slightly. Just after cresting the trail's highest point on the mountain, turn right on the Zealand Mountain summit spur and go 0.1 miles to the flat, viewless summit, marked by an artistic sign. Return to the main trail and descend steeply for 0.2 miles, then begin a moderate one mile climb to Mt. Guyot. In 0.4 miles, the climb becomes easier. Higher up, the trail becomes very rocky. After a slight descent, the trail turns sharply left and ascends 0.2 miles to the summit, emerging from the forest into the alpine zone. There are wide views here, but Guyot's southwest summit is 0.1 miles away and offers better views. Descend the west side of the summit and turn left onto Bondcliff Trail. The trail briefly passes through the forest and re-enters the alpine zone. Now, there are views in all directions. Huge South Twin Mountain dominates the view back toward the summit. To the east and west are spectacular wilderness views. To the west, the Franconia Range rises behind Owl's Head Mountain. Many landslides are nearby on the slopes of Southwest Twin. This view will be greatly improved from West Bond. To the east, across the vast valleys are the Presidential, Willey, and Nancy Ranges. Much of this view was seen earlier from Zeacliff, and it will be improved later from Mt. Bond. Both Bonds loom directly ahead. Descend from Guyot and quickly enter the forest again. Descend 0.4 miles, steeply at times and flat at others, to the col between Mts. Guyot and Bond. The trail passes a spur to a campsite on the left, and begins climbing steeply. Just after entering the Pemigewasset Wilderness, turn right onto West Bond Spur (0.2 miles from the col). An easy descent and equally easy climb of 0.5 miles, steeper toward the end, leads to the pointed summit of West Bond, when indescribably beautiful views open. Most impressive is the view of Bondcliff across a deep valley. Just to the right of the ridge connecting Bondcliff with Mt. Bond are Mt. Carrigain and Mt. Hancock. Several summits in the Sandwich Range peek out behind. Above and to the right of Bondcliff are Mt. Osceola and the Scar Ridge, with Mt. Tecumseh behind. In the valley below, you can clearly see the East Branch of the Pemigewasset River. To the right of West Bond's nearby west summit is Owl's Head Mountain, with the mighty Franconia Range behind. Several talus patches are visible on the lower slopes of Owl's Head. Across a long ridge from Mt. Lafayette is Mt. Garfield. To the right of Mt. Garfield is Southwest Twin. Between this and Mt. Guyot are two bowl-shaped basins, marked by impressive slides and talus patches. To the right of Guyot are the distant Northern Presidentials. Finally, directly to the east is Mt. Bond. Back on Bondcliff Trail, it is a very easy 0.5 mile climb to Mt. Bond. From the tiny alpine zone on its summit, there are equally amazing views in all directions. To the west, the view is much the same as from West Bond, except that West Bond itself, quite an interesting mountain to look at, is now in the view. To the east, the expanse of the eastern Pemigewasset Wilderness stretches out before you. Parts of this view were seen before from Zeacliff and Mt. Guyot, but now the full panorama is shown. Now, from a higher viewpoint, distant peaks in the Great North Woods and Maine rise above those seen before. There is also a good view of Zealand Ridge and the route you hiked to get here.